Many applications may wish to use location data simultaneously on one computer. Also, there are several incompatible protocols for delivering location information, including flavors of NMEA-0183, Rockwell and SiRF binary protocols, AIS, and others. To solve both of these problems, Unix developers created the gpsd daemon, which interprets all of the protocols and delivers a common data format to multiple location consumers. the text name to use for displaying the remote GPS on the YAAC map. the APRS symbol to use for displaying the remote GPS on the YAAC map. 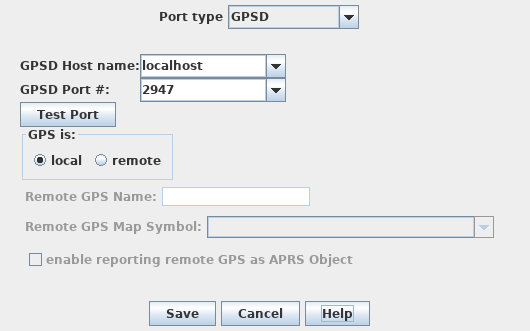 whether or not the remote GPS should also be transmitted to the APRS networks as a locally-originated APRS Object with the specified name and symbol.